Wallace Collection was founded in 1968 by Sylvain Vanholme, Freddy Nieuland, Marc Hérouet, Christian Janssens, Raymond Vincent and Jacques Namotte. The Belgian band moved to England and named themselves after the museum in Central London. Their debut album was recorded at Abbey Road studios and was released in 1969. 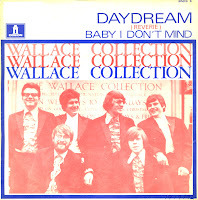 The single 'Daydream' became a hit all over Europe, including a number one hit in Belgium and reaching number 14 in the Netherlands. They could never equal the success of this one single and subsequently they split up in 1971. 'Daydream' is an extraordinary song, reminiscent of the Beatles' 'Hey Jude' (1976). I bought this single, with a picture of the band posing before the museum, a decade after I first heard the song. It's one of those songs you will always remember after hearing it once.